It is one thing to know that from a hydrographical perspective Lake Michigan and Lake Huron are considered a single lake. It is another experience to view the long curving blue sweep of Lake Huron merging into the misty blue vistas of Lake Michigan from the top of the Mackinac Island Bridge or the "Mighty Mack." Crossing the Mackinac Bridge can be frightening if your eyes are fixed on its height instead of its graceful lines and exhilarating if you consider its background, scenery, and history as you are negotiating its curves or gazing at the Straits many feet blow. Besides spanning the Straits of Mackinac, a five mile stretch of water separating Michigan’s Upper and Lower Peninsulas, the Mackinac Bridge provides a social, cultural, economic, and recreational connection to Michigan’s Upper Peninsula. 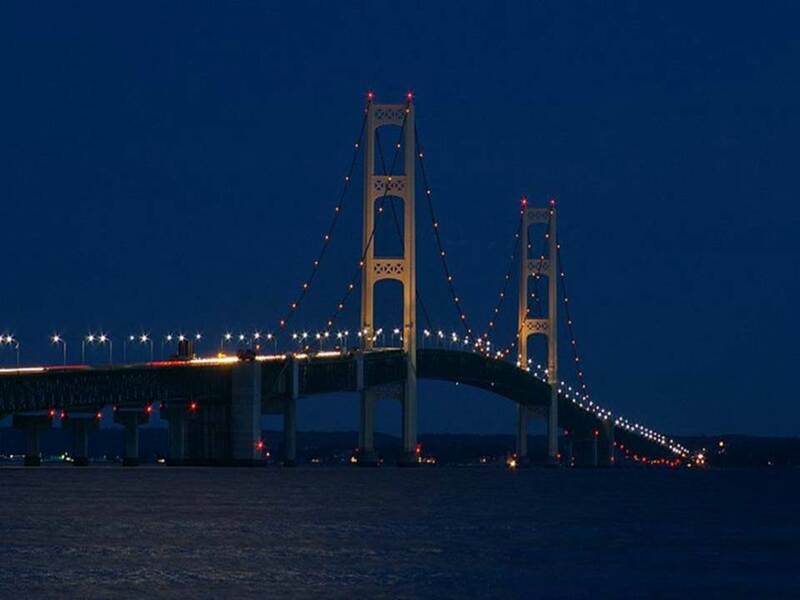 It is a connecting bridge with a reasonable toll and the Mackinac Bridge is maintained and operated exclusively with toll revenue. The Mackinac Bridge is the longest suspension bridge in the western hemisphere with a suspension length of 8,164 feet. The Akashi Kaikyo Bridge in Japan is the longest suspension bridge in the world with a total suspension of 12,826 feet and the Great Belt Bridge in Halsskov-Sprogoe, Denmark, is the second longest suspension bridge in the world with a total suspension of 8,921 feet. The Straits of Mackinac are five miles wide with an average depth of 120 feet and hydrologically, instead of connecting two separate lakes they are a narrow point that defines two lobes of a single Lake Michigan-Huron. The Straits were an important fur trade route for Native Americans, and Fort Mackinac, founded in 1781 on Mackinac Island, became a British colonial and early American military base and fur trade center. Settlers on both sides of the straits of Mackinac dreamed of a bridge across the Straits instead of the seasonal ferry boats. The 1883 dedication of the Brooklyn Bridge encouraged Mackinac Bridge backers. The Board of directors at the famous Grand Hotel on Mackinac Island met for the first time on July 1, 1888, and the meeting minutes reveal that Cornelius Vanderbilt remarked that to complement the best hotel in the world "now what we need is a bridge across the Straits." Ideas of floating tunnels and other Strait crossing methods surfaced and resurfaced over the next several decades. In 1923, the Michigan State Legislature ordered the State highway Department to establish a ferry service at the Straits of Mackinac. Within five years, ferry traffic expanded so much that then Governor Fred Green ordered a study of bridge feasibility. After a bridge authority had been created and disbanded, the matter of building a bridge across the Straits was again revived in 1934 and the Michigan State Legislature created the Mackinac Straits Bridge Authority to investigate the feasibility of a bridge. The Authority concluded that a bridge could be constructed directly across the Straits at an estimated cost of not more than $32,400,000 for a combined two lane highway and a one track railway bridge. Between 1934, and 1950, with time out for World War II, officials worked to make the bridge a reality and by 1950, the State of Michigan had appointed another Bridge Authority. In January 1951, the Bridge Authority submitted a favorable preliminary report that stated a bridge could be built and financed with revenue bonds for $86,000,000 . A shortage of materials because of the Korean War delayed the construction until early in 1952. Immediately, the Authority asked the Reconstruction Finance Corporation to purchase $85,000,000 worth of bonds. After fluctuations in the market, toward the end of 1953 investors bought $99,800,000 worth of Mackinac Bridge bonds and contracts that had been awarded contingent upon financing were immediately implemented. Engineer Dr. David B. Steinman designed the Mackinac Bridge, the world’s longest suspension bridge between cable anchorages. Merritt-Chapman & Scott Corporation built all of the foundations and The American Bridge Division of the United States Steel Corporation won a $44,532,900 contract to build the bridge. In the mills of United States Steel Corporation, the various shapes, plates, bars, wire and cables of steel necessary for the superstructure, caissons and cofferdams of the foundation were made. Ceremonies on May 7 and 8, 1954, at St. Ignace and Mackinaw City officially launched the Mighty Mack project. The Mackinac Bridge opened to traffic on November 1, 1957, right on schedule and despite countless hazards of constructing a bridge over the turbulent Straits of Mackinac. Finlandia University is located in Hancock, Michigan, the northernmost city in Michigan in the Keweenaw Peninsula. Every year, Finlandia University Gallery sponsors art lectures, exhibits, and series. From December 1, 2011 to January 14, 2011, Finlandia University Gallery will hold a Contemporary Finnish American Artists Series Twentieth Year Retrospective. The Retrospective exhibit includes all 19 artists from the series . Michigan Technological University sponsors a winter carnival in January and February of every year and snowmobile races and events roar and race from one end of the Upper Peninsula to the other. The Upper Peninsula Travel and Recreation Association maintains a website that lists many activities in the Upper Peninsula. Crossing the Mackinac Bridge between Michigan's Upper and Lower Peninsulas, the sweep of the Lake Michigan-Huron is spectacular with each crossing. The graceful curves of the bridge, the force of the wind high above the Straits and the water dancing below combine to create Mighty Mack siren song that lures people to cross it again and again.